Out of print. This pattern was available for $6.00. The whole garment is knitted from top to down edge as one piece, using for casting on 5 double pointed needles. 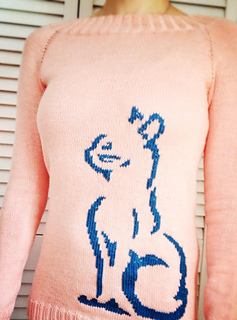 A cat print is made using duplicate vertical stitch (embroidery on knitting)! Remember: do not reverse sides and stitches, follow patterns. Use only knit sts. for stockinette stitch pattern, double knit sts.&double purl sts. in the same order for bouble rib pattern.